Last May 31st, we had the opportunity to meet with our valued group of USA customers in Dallas TX. 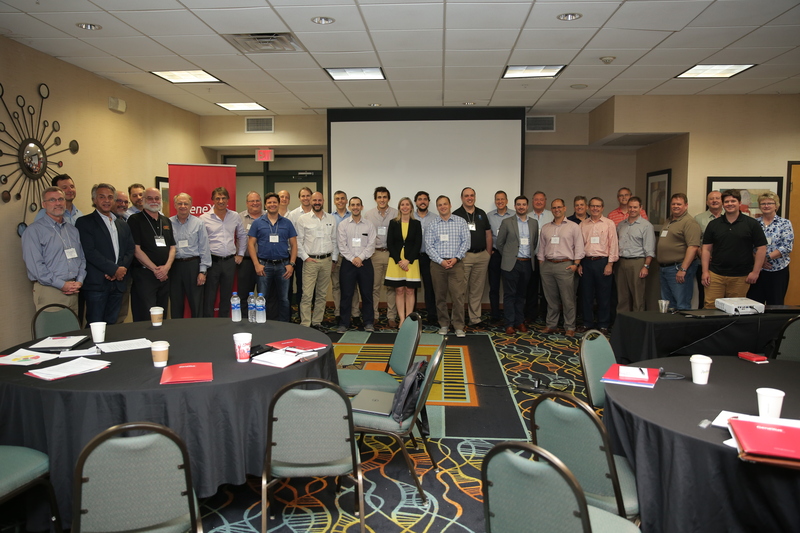 The executive team from GeneXus came to Texas to deliver a state of art of Genexus and the challenges the speed of the technology is bringing to the business. Besides our customers we also had the presence of the Texas technology community members attending the event. The main objective was to present the Future of Enterprise Software Development. This was a full-day of informative keynotes, presentations and conversations on how c-suite executives and IT managers can develop bold digital transformation strategies incorporating powerful new technologies like AI, machine learning, chatbots, blockchain, and more. Attending the event we had Nicolás Jodal, GeneXus CEO, Gastón Milano, GeneXus CTO, Eugenio García, SME in AI/ML and Gisela Bertelli – GeneXus SVP Commercial Business. The GeneXus leadership team presented an inspiring vision of the future for enterprise companies and demonstrate how GeneXus can help customers to boldly embrace these new opportunities to shape the future. Nicolás Jodal shared the challenges companies are facing developing applications. But before he shared the following statement from Mark Andreessen – founder of Netscape – “Software is eating the world, in all sectors. In the future every company will become a software company”. And that is a very true statement companies are facing with the digital transformation where traditional IT structure doesn’t have a future any more. The reality companies need to look for technologies that can keep them relevant in a market full of opportunities for disruption. And this brings to another point Nicolás shared with our customers and members of the technology community in Texas- developing software is getting more difficult than ever. Which brings another reason the companies need to find solutions to bring agility and flexibility. Jodal during his presentation explored the needs to adopt the concept of IT BI-modal infrastructure to allow business to gain the necessary speed to deliver what customers are looking forward. And the needs to adopt the new technologies such as blockchain, artificial intelligence and machine learning that will continue making the changes in the way technology is applied. The next presenter was GeneXus CTO Gastón Milano, who deliver a message related to what is happening to the GeneXus suite of solutions in short and mid-term. The flow of his message was founded on these 3 pillars – Customer Experience, Security and Integration. Three critical foundations to deliver what the market is looking for. The aspects of customer experience is based on web and mobile experience, valuing the ability to reach, engage and use of the information. On this topic Gastón was presenting how GeneXus is integrating chatbot solution into the suite to engage in communication with customers or allowing customers developing solutions for better engagement with their end users cherishing the customer experience. Another area of improvement is powering analytics with GeneXus supporting business decisions with critical data analysis. The other foundation is security with the usage of standard ASVS – Application Security Validation System which works around sensitive data protection, apps obfuscation and offline DB encryption. More safe way to develop an application better way to protect company data e users information. The third pillar is integration – as critical as the other 2 foundation, the integration looks for interoperability and integration. The ability to integrate GeneXus with key cognitive services from providers such as IBM Watson, SAP Leonard, Microsoft Cognitive Services and Amazon brings a great differentiation of GeneXus capabilities versus other competitors and brings to the GeneXus users a powerful tool to be ahead of their competition. Gastón closed his presentation showing the completeness of GeneXus from devops, designops and modelops – delivering what end users are expecting with speed, security and flexibility. Our next presenter – Eugenio García – did an outstanding job talking about two topics – Artificial Intelligence and Business Process Modeler. The first topic – per its name – always get great attention – will artificial intelligent kill the human being? Too dramatic right? But the reality is – we are still on a long way to go to get the maximum level of AI that could interfere in most critical tasks we do as human. We are seeing amazing development associate with AI to improve human being quality. More and more tools with AI are necessary to perform challenge tasks. Eugenio presented how we are using AI with our tools – by the way the foundation of GeneXus is based on AI. In this area he talked about the new chatbot generator, facial recognition and co innovation projects we can bring using tools and expertise from GeneXus. The other topic was business process and how to improve. As much necessary to have the right tools to run a business, is tools to improve/manage better process. Plus, we are talking about digital transformation and it is difficult to see which path that can take companies there. And the business process could be one of the key elements to take the companies there. Eugenio presented how GeneXus BPM can help collaboration among employees, partners and “things”. At the end of the day Gisela Bertelli presented the strategy and direction we are taking with opportunities for co-innovation solutions. This is a critical area where we offer to customers the expertise and tools for creating an innovative solution and in conjunction with a partner to deliver and implement it. This open opportunities in so many different areas such as IoT, Machine Learning, Automation and more. Besides the presentation from GeneXus leaders we also had the participation of GeneXus partners GXC and DVelop. Both presented solutions to enhance GeneXus capabilities of software development. The day run so fast even with the amount of information shared. And the feedback was extremely positive. We are now heading to our major event GX28 in Montevideo on September 24 thru 26 where we expect to meet again this time with other customers and partners from around the world. Artificial Intelligence is all about creating and developing machines that act, behave, react and work like human beings themselves. These machines are designed in such a brilliant manner that they are capable of performing activities like Speech Recognition, Learning, Planning, Problem Solving etc.